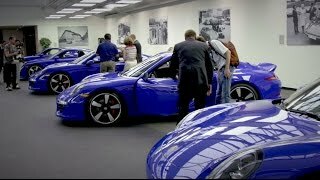 To celebrate the 50th anniversary of club Porsche at its Georgia located US headquarters introduced the spiritual successor to the 997-based 911 Club Coupe from the year 2005, enhancing it with the additions from sportier Carrera GTS. Though GTS Club Coupe 2015 looks more of a derived model but there’s a lot it brings enhanced and redesigned under its hood. After all we are talking about a 60 pieces special edition to be out through lottery for just North America. Let’s see in a descriptive way. As soon as you enter the interior of Porsche GTS Club Coupe 2015 you have enlightening door sills with embossed ‘GTS Club Coupe’ on them while the storage compartment cover in center displays ‘60’ on it. This is how the very entrance spreads the sign of model being a limited edition. 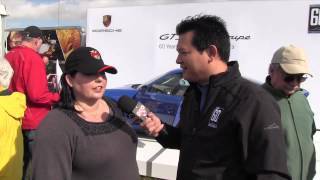 Further to the same queue eyes will stop right above the glove compartment on passenger side of dashboard lettered ‘GTS Club Coupe 60 Years Porsche Club of America’. Talking further about the standard interior package of GTS Club Coupe 2015 noticeable are blended with red accents leather and Alcantara sports seats, seat belts and headrests with marked ‘GTS’ text on it. A satellite Navigation system has also been included in package while the multi function steering wheel is also mounted with a tachometer and 12 o’clock marker. 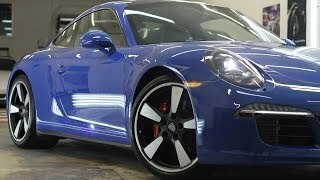 If you want to add a few more to these, Porsche also provides an option to go for Club Coupe Package which includes, Club Blau-painted key, a leather edged floor mats with essence of red and blue stitching and a leather key case. 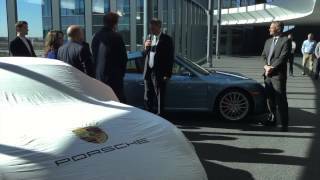 The exterior of Porsche GTS Club Coupe 2015 is bit more muscular than shell of Carrera 4. GTS Club Coupe comes with a sportier front fascia while the sides spread the aggression through its 20” five spoke wheels. Painted in deep blue (however Porsche calls it Club Blau) is deeper than what you can imagine and this indeed turns to be a positive frame. 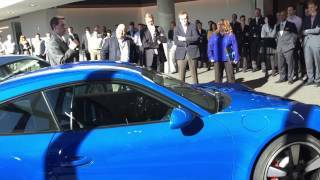 Front corners of each door and the bottom front portrays ‘Club Coupe’ encrypted on them while the headlamps and taillights gets the blend of black around the sport side mirrors come as standards with Porsche GTS Club Coupe 2015. The Porsche GTS Club Coupe gets its power through a 3.8 liter direct injection flat six engine delivering 430 horsepower to enthrall the streets. GTS Club Coupe is paired with both seven-speed manual and seven speed PDK transmission sending power to the rear wheels. While on one side the manual transmission is capable of taking the driver to a top speed of 190 mph, PDK is capable of reaching 189 mph of top speed. Simultaneously under the above respective hoods the standstill to 60 mph sprint gets covered in 4.2 seconds and 3.8 seconds respectively.